Manchester United are reportedly growing confident of committing both Anthony Martial and David de Gea to long-term contracts with the club. The duo's existing deals were initially due to expire at the end of the season before United took the option to trigger the 12-month extension clause available in their respective contracts. Still, the club are eager to commit them for the long-term and according to Evening Standard, they are making strides towards sorting out the futures of both players. 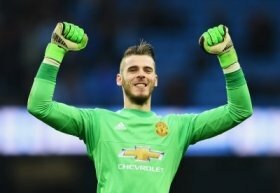 Martial and De Gea had been considering their positions at Old Trafford earlier in the campaign with the club struggling under the guidance of manager Jose Mourinho. However, they have since witnessed a change in fortunes for United with the dismissal of Mourinho and this seems to have encouraged contract talks with the club. Martial is currently close to penning a fresh five-year contract with United while De Gea is likely to commit to the same length, though the club have yet to find a breakthrough in terms of the wages.